This would be a perfect addition to any little princess's party...... It offers a 360 degree castle design with four tall spires. 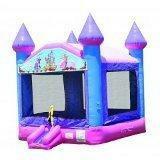 This pretty pink and purple, castle bounce house is enhanced by a colorful fairy tale princess panel above the entrance, making it the perfect addition to any girl's party!!!!! !